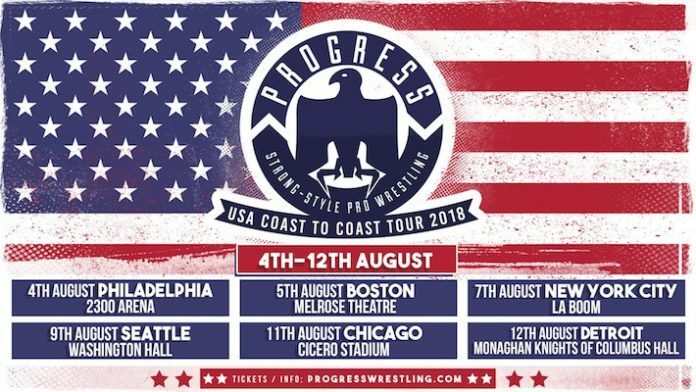 PROGRESS held their New York City stop on the #CoastToCoast tour last night from the La Boom venue. One of the announced bouts for the show saw CCK take on IMPACT Wrestling’s LAX for the PROGRESS Tag Team Championships. CCK member Kid Lykos unfortunately suffered from an injury early in the tour and had to be taken out of the remaining dates. Jon Gresham was brought in as a late replacement to reform the Calamari Catch Kings alongside Chris Brookes which led to this bout. Hopefully this will be available on Demand PROGRESS in the near future. #CCK vs #LAX is legitimately one of the best matches I’ve ever seen. Ever. Like, ever. One of the GREATEST tag team matches we’ve ever had, happened tonight at #PROGRESSNYC. I can’t even express the feelings and emotions that we felt tonight.